All sets, costumes and sound scores designed and executed by Eiko & Koma, except as noted. Works being reconstructed as part of Eiko & Koma’s Retrospective Project (2009-2012) are marked with an asterisk. These reconstructions are made possible in part by support from the American Express Foundation. Approximately 25-55 minutes. A collaboration with Native-American composer-flutist Robart Mirabal, who adapted his score for Eiko & Koma’s Land (1991) for the new work. Premiere: Danspace Project (New York, NY) May 27, 2010. Raven is the centerpiece of Eiko & Koma’s Retrospective Project (2009-2012). Designed as a radically scalable work, it can be performed in theaters, galleries or outdoor settings as well as special sites selected for the occasion. Its length will be appropriate to the setting. The performance environment evokes a scorched landscape. Raven was made possible, in part, with funds from the 2009-2010 Danspace Project Commissioning Initiative. Additional support was provided by the Andrew W. Mellon Foundation, the New England Foundation for the Arts’ National Dance Project, the National Endowment for the Arts and the Japan Foundation’s Performing Arts JAPAN program. Raven was built and previewed at Wesleyan University in the Zhilka Gallery. Robert Mirabal’s original 1991 score was made possible with support from the Rockefeller Foundation's Multi-Arts Production Fund and Meet the Composer's Composer/Choreographer Project. Created for the Zilkha Gallery at Wesleyan University (Middletown, CT) where it opened on November 19, 2009 with a celebratory event during which Eiko & Koma presented excerpts from Raven as a work-in-progress, White Dance, Breath and The Caravan Project. 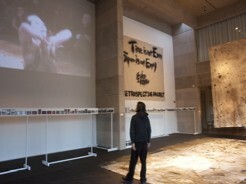 The installation itself was open until December 20, 2009, and marked the inauguration of Eiko & Koma’s Retrospective Project. Made possible in part with funds from the American Express Foundation. Approximately 70 minutes, without intermission. A collaboration of Eiko & Koma with young Cambodian performers Peace (Setheap Sorn, age 18) and Charian (Chakreya So, age 17). Lighting by David Ferri. Developed during residencies at Vassar College (Poughkeepsie, NY), and the Maggie Allesee National Center for Choreography at Florida State University (Tallahassee). Preview Performances at The Dance Place, Washington, DC, Sept. 20, 21, 2008. Premiere: Walker Art Center, Minneapolis MN, October 9-11, 2008. Toured to Alverno College in Milwaukee, WI, the Wang Center at SUNY/Stony Brook, NY, and the Joyce Theater in New York, NY. Produced by Inta, Inc. in association with Asia Society. Co-commissioned by the Joyce Theater’s Stephen and Cathy Weinroth Fund for New Work and by the Walker Art Center (Minneapolis, MN) with support provided by the William and Nadine McGuire Commissioning Fund. Additional funding provided by the National Endowment for the Arts, the New York State Council on the Arts and the Andrew W. Mellon Foundation. Approximately 60 minutes, without intermission. A collaboration of Eiko & Koma with celebrated avant-garde pianist Margaret Leng Tan. Music: John Cage, Somei Satoh, Bunita Marcus. Lighting by David Ferri. Premiere: Japan Society, New York City, October 18, 2007. Commissioned by Japan Society in celebration of the Society’s centennial. Funded in part by the National Dance Project of the New England Foundation for the Arts, with lead funding from Doris Duke Charitable Foundation. Additional funding provided by The Andrew W. Mellon Foundation, The Ford Foundation and JP Morgan Chase. Suport for the creation of Mourning was also provided by the Performing Arts JAPAN program of the Japan Foundation; the National Endowment for the Arts Dance Program; the New York State Council on the Arts Dance Program; the New York State Music Fund and the American Music Center’s Live Music for Dance program. General support was provided by the Andrew W. Mellon Foundation, United States Artists and Altria Group. Approximately 30 minutes, without intermission. A collaboration of Eiko & Koma with young Cambodian performers Peace and Charian. Lighting by David Ferri. Premiere: Reynolds Theater, American Dance Festvial (Durham, NC), June 28, 2007. Made possible, in part, by the Asian Cultural Council and the National Endowment for the Arts. Approximately 35 minutes, without intermission. Eiko & Koma’s reworking of their 1983 duet, set on Peace and Charian. Lighting by David Ferri. Premiere: Reynolds Theater, American Dance Festival (Durham, NC), June 28, 2007. Commissioned by the 2007 American Dance Festival and made possible, in part, by the Asian Cultural Council and the National Endowment for the Arts. Approx. 60 minutes, without intermission. Eiko & Koma’s outdoor version of the larger 2006 work, made in collaboration with Peace and Charian. Premiere: Danspace Project, New York, , May 24, 2007. Co-produced by Inta, Inc, Danspace, and Asia Society. Approximately 80 minutes, without intermission. A collaboration of Eiko & Koma with the Reyum Painitng Collective, graduates and students of the Reyum Institute of Arts and Culture in Phonm Penh, Cambodia, who created the set and performed both dance and large scale action painting along with Eiko & Koma. Lighting by David Ferri. Music Director: Sam-Ang Sam. Premeiere: Clarice Smith Performing Arts Center at the University of Maryland, March 30,2006. Made possible by a National Dance Project Production Grant and support from the Japan Foundation’s Performing Arts Japan program, the National Endowment for the Arts Dance Program, the Rockefeller Foundation’s Multi-Arts Production Fund, the Andrew W. Mellon Foundation and the Altria Group, Inc. Toured to Florida State University in Tallahasse, FL, theClarice Smith Performing Arts Center at the University of Maryland, the CarpenterPerforming Arts Center at University of California Long Beach, REDCAT (Roy and EdnaDisney/Cal Arts Theater) in Los Angles, CA, Arizona State University in Tempe, AZ, Skirball Cultural Center in Los Angles, Center for the Arts at Wesleyan University in Middletown, CT, VSA Arts of New Mexico in Albuquerque, the Museum of Contemporary Art in Chicago, IL, and Yerba Buena Center for the Arts in San Francisco, CA. Death Poem was commissioned by the Dance Center of Columbia College (Chicago, IL) and Danspace Project (New York, NY). Lighting by David Ferri. Premiere: Dance Center, Chicago, IL, November 18, 2004. Also made possible with funding from the National Endowment for the Arts and the Altria Group, Inc. Approximately 20 minutes. Originally premiered in 1984 as Night Tide, Mourning was re-created for the 2004 Imagine Festival of Arts, Issues and Ideas, a city-wide festival designed to inspire, instigate and support civic engagement through the arts. The work explores mourning as a metaphor of each body/life as singularly precious, vulnerable and non-exchangeable. Premiere: Asia Sociey, New York, NY, August 28, 2004. Presented in association with Dancing in the Streets. Night Tide was originally commissioned by Dance Theater Workshop (New York, NY) under a grant from the Jerome Foundation of Saint Paul, MN, and was also made possible by National Endowment for the Arts Grants to Dance Companies funding. Approximately 18 minutes. Music by Tatsunosuke Koshiya, First Love, sung by Yoshikazu Mera. Lighting by David Ferri. Created on the occasion of the presentation to Eiko & Koma of the 2004 Samuel H. Scripps American Dance Festival Award for lifetime achievement in modern dance, and called on that occasion Duet for Tonight. The new duet alludes to past works, but combined and rechoreographed for this special occasion. Premiere, Page Auditorium, American Dance Festival, Durham, NC, June 27, 2004. Approximately 50 minutes, without intermission. An outdoor performance ritual conceived and designed by Eiko & Koma, who continue their exploration of the body as part of the landscape and the landscape as an extension of the body. The work evokes the tree as an icon, in many cultures, of resilience, rebirth and the continuity of life. Vocalizations and text by Sharon Dennis Wyeth. Piano music composed and performed by Georgia Wyeth. Lighting Design by Owen Hughes in collaboration with Eiko & Koma. Project Consultant: Irene Oppenheim. Tree Song was commissioned by the 2003 American Dance Festival, where it premiered July 5, 2003, on the Duke University East Campus, with support from the Doris Duke Awards for New Work and the Altria Group, Inc. Premiere of the full, collaborative vesion: Danspace Project (St. Mark’s graveyard), New York, NY, May 27, 2004. The work’s creation was also made possible with funds from the Japan Foundation’s Performing Arts Japan Program, the Rockefeller Foundation’s Multi-Arts Production Fund, and the National Endowment for the Arts. The work was developed during a residency at the Kaatsbaan International Dance Center (Tivoli, NY) made possible with funds from the New York State Council on the Arts. A portable and flexible outdoor installation conceived, designed and fabricated by EIko & Koma as a commemoration of life’s resilience amid violence and devastation. Depending on how it is sited, the work can be performed in daylight or at dusk and can last from 45 minutes to two or more hours. World premiere: Festival Baltoscandal (Rakvere, Estonia), June 18, 2002, with generous funding from The Trust for Mutual Understanding and Arts International. New York premiere: The Belvedere, Battery Park City, July 16, 2002. Offering was developed for the proscenium to an original score by the clarinetist David Krakauer. The work was co-commissioned by Dancing in the Streets (New York), the Walker Art Center (Minneapolis, where the proscenium version premiered January 9, 2003) and the University of Arizona (Tucson). The work’s creation was also made possible with generous funding from the Japan Foundation through its Performing Arts Japan program and from the National Endowment for the Arts. Approximately 40 minutes, without intermission. A collaboration of Eiko & Koma with cellist Joan Jeanrenaud, who performs her score live, and the dancer and choreographer Anna Halprin. Lighting design by Patty-Ann Farrell. Premiere: Terrace Theater, John F. Kennedy Center for the Performing Arts (Washington, DC), October 16, 2001. Commis¬sioned by the Kennedy Center. Made possible by a National Dance Project Production Grant and support from the Japan Foundation,the National Endowment for the Arts, the Chase Manhattan Foundation and the Zellerbach Family Fund. Be With also toured to the Yerba Buena Center for the Arts in San Francisco, CA and, with New York State Council on the Arts support, to the Joyce Theater in New York. Approximately 80 minutes, without intermission. Set to an originally commissioned score for a cappella voices by Joseph Jennings, developed in collaboration with singers from the James Hall Worship and Praise Choir of Brooklyn, NY. Musical Direction by the composer. Lighting designed by Scott Poitras in collaboration with Jeff Fontaine. Premiere: Reynolds Industries Theater, American Dance Festival (Durham, NC) June 20, 2000. Commissioned by the 2000 American Dance Festival. The creation of When Nights Were Dark was made possible by: the Doris Duke Fund for Dance of the National Dance Project, a program administered by the New England Foundation for the Arts with lead funding from the National Endowment for the Arts and the Andrew W. Mellon Foundation; Meet The Composer’s Composer/Choreographer Project, a national program funded by the Pew Charitable Trusts, Philip Morris Companies, Inc. and the Irene Diamond Fund; the Japan Foundation’s Performing Arts Japan Program, administered by the Japan-United States Partnership for the Performing Arts; the Rockefeller Foundation’s Multi-Arts Production Fund; the National Endowment for the Arts Presentation and Creation Program; and the New York State Council on the Arts Dance Program. Other support was provided by the Charles and Catherine MacArthur Foundation, the Andrew W. Mellon Foundation, the Lila Acheson Wallace Theater Fund and the Chase Manhattan Foundation. In addition to the American Dance Festival, a number of other presenting organizations provided invaluable development time and facilities: Dancing in the Streets (New York, NY); the Williams Center for the Arts at Lafayette College (Easton, PA); The Kitchen (New York, NY); the Lower Manhattan Cultural Council (New York, NY) and Novel Hall (Taipei, Taiwan). Touring of When Nights Were Dark suring the 2000-2001 season was made possible in part with fee support from the National Dance Project. Approximately 25 minutes. Lighting design by Jeff Fontaine. Premiere: Reynolds Theater, American Dance Festival (Durham, NC) June 28, 1999. Commissioned by the 1999 American Dance Festival with funds from the Doris Duke Charitable Foundation. Approximately thirty minutes. Lighting design by Jeff Fontaine. Premiere: John F. Kennedy Center for the Performing Arts (Washington, DC) April 7, 1998. Commissioned by the John F. Kennedy Center for the Performing Arts with funds from the Doris Duke Charitable Foundation. Presented at the Whitney Museum of American Art in New York. Premiere: May 28, 1998. Conceived as a “living installation,” it occupied the museum’s Film/Video Gallery for four weeks, and could be experienced all the hours that the museum was open to the public. The installation can be adapted for other gallery spaces and different temporal contexts. Made possible with support from the Japan Foundation’s Performing Arts JAPAN program, administered by the Japan-United States Partnership for the Performing Arts, and by the Lila Acheson Wallace Theater Fund at New York Community Trust. Approximately 75 minutes. Lighting design by Jeff Fontaine. Score: originally commissioned string quartet by Japanese composer Somei Satoh, performed live by the Kronos Quartet at the work’s premiere at the Williams Center for the Arts, Lafayette College in Easton, PA on August 29, 1997 and at subsequent performances in Buenos Aires, Los Angeles, San Francisco and New York. Recorded for subsequent touring when live music is not feasible. Project made possible with funding support from the Japan Foundation through its Performing Arts JAPAN program (administered by the Japan-U.S. Partnership for the Performing Arts), from the newly inaugurated Meet The Composer/International Creative Collaborations program funded by the Ford Foundation, from the National Dance Project, from the National Endowment for the Arts Creation & Presentation Program, and from a Lila Wallace-Reader’s Digest Arts Partners Project Grant to the Williams Center for the Arts at Lafayette College. Much of the movement and visual material was created during extended residencies at Lafayette. Approximately 20 minutes. Lighting design by Jeff Fontaine. Slide image by Sandra Lerner. Music: Traditional Japanese. Premiere: Japan Society (New York, NY) November 16, 1995. Developed at Art Awareness in Lexington, NY during creative residencies made possible by the National Endowment for the Arts Dance Program. Commissioned by Japan Society. Additional funding from the New York State Council on the Arts and the Harkness Foundations for Dance. Approximately 60 minutes. An outdoor environmental collaboration with naturalist/visual artist Judd Weisberg, and which takes place after sunset in a stream or other body of flowing water.. Sound score: Japanese traditional music. Film by James Byrne. Premiere: Art Awareness (Lexington, NY) September 3, 1995 in the Schoharie Creek, where it was in large measure developed. The creation of River was supported by The Japan Foundation through the Performing Arts JAPAN Program and the Rockefeller Foundation’s Multi-Arts Production Fund. Commissioned jointly by Art Awareness, the Williams Center for the Arts (Easton, PA), the Atlantic Center for the Arts (New Smyrna Beach, FL), the American Dance Festival (Durham, NC), the Walker Art Center (Minneapolis, MN), the Jacob’s Pillow Dance Festival (Becket, MA) and the Environmental Performance Network, a project of Dancing in the Streets (New York, NY). This commission was made possible, in part, with funds from the National Endowment for the Arts Presenting and Commissioning Program. 12 minutes. Solo for Koma. Lighting design by Jeff Fontaine. Score by Ushio Torikai. Premiere: New Lex Theater (Lexington, NY) August 27, 1994. Developed at Art Awareness in Lexington, NY during an August 1994 creative residency made possible by the National Endowment for the Arts Dance Program. 20 minutes. For five performers. Score by Jon Gibson. Premiere: Dance Alloy, City Theatre (Pittsburgh, PA) February 9, 1994. Presented by Pittsburgh Dance Council and commissioned by Dance Alloy (Mark Taylor, Artistic Director) under the auspices of the National Dance Repertory Enrichment Program. 70 minutes. Performed with Yuta Otake. Lighting design by Jeff Fontaine. Set Design by Eiko & Koma and Jeff Fontaine. Sound Score conceived by Robert Mirabal and Eiko & Koma. Vocal Score recorded by Chanticleer, Directed by Joseph Jennings, based on Virgen Sancta by Francisco Guerrero (1528-1599), arranged by Joseph Jennings. Irish Bagpipe played by Bill Ochs. Floor Drop painted by Vaughn Patterson. Premiere: Hennepin Center for the Performing Arts (Minneapolis, MN) March 26, 1993. Commissioned jointly by the Walker Art Center (Minneapolis, MN), the Jacob's Pillow Dance Festival (Becket, MA), Art Awareness (Lexington, NY), the Krannert Center for the Performing Arts/University of Illinois (Urbana, IL), the Wexner Center for the Arts/Ohio State University (Columbus, OH), the American Dance Festival (Durham, NC and Salt Lake City, UT), the University of California, Los Angeles and the Japanese American Cultural and Community Center (Los Angeles, CA). This commission was made possible, in part, with funds from the National Endowment for the Arts. The composer and choreographer commission fees were made possible by a grant from Meet The Composer's Composer/Choreographer Project, a national progam funded by the Ford Foundation and the Pew Charitable Trusts. Additional funding was provided by The Nathan Cummings Foundation, The Greenwall Foundation, The Harkness Foundations for Dance and the Joyce Mertz-Gilmore Foundation. This piece was created, in part, during creative residencies at Jacob's Pillow and Art Awareness. 75 minutes. Commissioned score by Robert Mirabal. Scenery designed and executed by Sandra Lerner. Lighting design by Jeff Fontaine. Premiere: Brooklyn Academy of Music (Brooklyn, NY) Next Wave Festival, November 5, 1991. Co-commissioned by the 1991 Next Wave Festival, the 1991 American Dance Festival and the Lied Center at the University of Nebraska, Lincoln. Major funding provided by the Rockefeller Foundation's Multi-Arts Production Fund and Meet the Composer's Composer/Choreographer Project. 40 minutes. Film by David Geary. Lighting design by Jeff Fontaine. Premiere: Painted Bride Art Center (Philadelphia, PA), November 10, 1989. Co-commissioned by the Painted Bride Art Center, The Dance Place (Washington, DC) and Dance Umbrella (Boston, MA) under the auspices of the National Performance Network Creation Fund, administered by Dance Theater Workshop of New York. 15 minutes. Score by Deuter: “Haleakala.”. Premiere: New Lex Theater (Lexington, NY), July 29, 1989. Developed at Art Awareness in Lexington, NY during a July 1989 creative residency made possible by a commissions grant from the Presenting Organizations Program of the New York State Council on the Arts. 15 minutes. Premiere: Reynolds Theater, Duke University (Durham, NC) June 19, 1989. Commissioned by the 1989 American Dance Festival with funds from the Lila Wallace-Reader's Digest Fund. 35 minutes. For Eiko & Koma plus four performers. Film by Dave Geary. Music: "Alturas de Macchu Picchu" by Los Jaivas. Lighting Design by Jeff Fontaine. Premiere: Southern Theater (Minneapolis, MN), May 3, 1989. Commissioned by the Walker Art Center (Minneapolis, MN) in collaboration with the Southern Theater and the Minnesota Dance Alliance, and made possible with funds from the National Endowment for the Arts Inter-Arts Program and McKnight Foundation. 30 minutes. Lighting design by Blu. Premiere: Brooklyn Academy of Music (Brooklyn, NY) Next Wave Festival November 29, 1988. Also made possible with funding from Art Matters, Inc. and the National Endowment for the Arts Dance Program. 70 minutes. A tetrology consisting of Beam, Shadows, Night Tide and Elegy. Premiere: Brooklyn Academy of Music (Brooklyn, NY) Next Wave Festival November 18, 1986. Shadows was commissioned by the 1986 Next Wave Festival. 30 minutes. For three women. Score by Sarangi. Premiere: CoDanceCo, Dance Theater Workshop (New York, NY) October 23, 1986. Commissioned by CoDanceCo (Nancy Duncan, Artistic Director) under the auspices of the National Choreography Project. 55 minutes. Set executed by Clayton Campbell. Film by David Geary. Lighting design by Blu. Premiere: Massachusetts College of Art (Boston, MA) Palace Road Theatre June 18, 1986. Commissioned by Dance Umbrella Boston, with funds from the Massachusetts Council on the Arts New Works Program. Additional funding provided by the National Endowment for the Arts Inter-Arts Program. 35 minutes. In silence. Lighting by Blu. Premiere: Dance Theater Workshop (New York, NY) November 14, 1985. Made possible by a grant from the Jerome Foundation of Saint Paul, MN. Also made possible by a Guggenheim Fellowship to Eiko & Koma. 20 minutes. Lighting Design by Blu. Premiere: Reynolds Theater, Duke University (Durham, NC) June 20, 1984. Commissioned by the 1984 American Dance Festival in celebration of its 50th anniversary season. Also made possible by National Endowment for the Arts Grants to Dance Companies funding. 20 minutes. Lighting Design by Blu. Premiere: Dance Theater Workshop (New York, NY) January 25, 1984. Commissioned by Dance Theater Workshop (New York, NY) under a grant from the Jerome Foundation of Saint Paul, MN. Also made possible by National Endowment for the Arts Grants to Dance Companies funding. 20 minutes. Music: Asian folk; harmonium played by Eiko. Lighting Design by Blu. Premiere: Reynolds Theater, Duke University (Durham, NC) July 20, 1983. Commissioned by the 1983 American Dance Festival. One hour. Music : Japanese, Tibetan and Indonesian folk. Lighting design by Blu. Premiere: Kampo Cultural Center (New York, NY) January 28, 1983. Made possible with funding from the Foundation for Contemporary Performance Art. 20 minutes. Poem by William Blake. Music by Allen Ginsberg, sung and played by Bob Carroll and his Dirt Band. Premiere: The Kitchen (New York, NY), November 27, 1981. One hour. Music: Andean folk. Premiere: Part 1 (Cell) Oberlin College (Oberlin, OH) September 18, 1980; Part 2 (Fisson) Dance Umbrella Festival (New York, NY) November 28, 1979; Part 3 (Entropy) Los Angeles Institute of Contemporary Art (Los Angeles, CA) February 6, 1981. 30 minutes. Music: Glenn Branca. Premiere: The Performing Garage (New York, NY) August 3, 1979. One hour. Music: Near Eastern. Lighting design by Blu. Premiere: Dance Theater Workshop (New York, NY) November 1978. 70 minutes. Music: Schubert, Hovhannes, Beatles. Premiere: Riverside Dance Festival (New York, NY) June 1977. One hour. Music: Medieval European, Bach. Premiere: Japan Society (New York, NY) May 6, 1976. This concert was Eiko & Koma's American debut. It’s recreation was commissioned, with National Endowment for the Arts support, by the Flynn Center for the Performing Arts (Burlington, VT), where it premiered on May 2008.